Season Five of America's Got Talent, an American talent show competition, began broadcasting in the United States during 2010, from June 1 to September 15. Unlike previous seasons, online auditions switched from being made via MySpace, to being made via YouTube, and the quarter-finals including two additional rounds to cover the best auditions from these and those selected as Wildcards during the selection process following the main auditions. As David Hasselhoff had left the program following the conclusion of the fourth season, NBC replaced him in his role with Howie Mandel. The fifth season was won by soul singer Michael Grimm, with classical crossover singer Jackie Evancho finishing in second, and performance group Fighting Gravity placing third. During its broadcast, the season averaged around 11.02 million viewers, with its season finale becoming the highest watched of any season in the program's history by attracting around 16.41 million viewers. 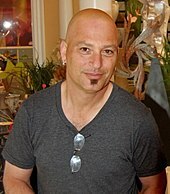 Howie Mandel was appointed as Hasselhoff's replacement a week after his departure was announced. Auditions for the fifth season's competition took place across Winter - mid-Spring 2010, with production staff holding the main auditions that would be filmed within the cities of Dallas, Los Angeles, New York, Portland, and Chicago, and at the Universal Orlando Resort. Prior to production starting, David Hasselhoff had decided to leave the program and focus on a new project, leaving NBC to locate a replacement for his role in the judging panel. A week after Hasselhoff announced his departure from America's Got Talent, the network unveiled his successor as Howie Mandel, who had recently finished his fourth season as host of the American edition of Deal or No Deal before its eight-year hiatus began that year. For this season, the production staff decided to include two new rounds in the quarter-finals. The first was arranged for online auditions - up until the fifth season, most audition made online were made via MySpace, but for this season, production staff altered the rules by stating that all online auditions would now be made via YouTube, in which amongst those submitted the judges would select eleven to participate in the competition alongside one additional act voted for by online voters. Those selected would then partake in a special quarter-final round and compete for a place in the semi-finals. The second new round saw the return of a Wildcard round, first used in the first season, although the format differed - it featured a mixture of those acts who failed to move past the Vegas Verdicts stage but secured a place after being chosen by the judges as Wildcard acts, alongside those who lost their initial quarter-final but were selected by the judges to be given a second chance at advancing into the semi-finals. Because of the new rounds, the rules on how many moved on into the semi-finals was altered and focused on four acts in each advancing - the top three voted for by the public, while the fourth spot would be decided upon by the judges between the acts that had placed fourth and fifth in the public vote. Despite arranging a variety of guest performers for this season, production staff were forced to cancel the involvement of Susan Boyle during the results of the Top 10 final, due to a legal complication - Boyle had been planned to sing a song performed by Lou Reed, but producers had failed to receive the legal rights for it to be used by her, and had to pull her off the program at the last minute. ^1 Ages denoted in this column pertain to a participant(s) age in their final performance for this season. ^2 These participants were entered into the Wildcard quarter-final after losing their initial quarter-final. ^3 This participant was originally eliminated during the Vegas Verdicts, but was brought back after another act that had passed that stage was forced to drop out for unknown reasons. ^4 The age of the dog in this act was not disclosed on the program. ^5 This participant initially dropped out for personal reasons, despite securing a place in the live rounds, but agreed to return as a quarter-finalist in the Wildcard round. Guest Performers, Results Show: Cast of Cirque Du Soleil, and cast of Train. Guest Performers, Results Show: Mike Posner, and the JabbaWockeeZ. ^6 Mandel's voting intention was not revealed due to the majority vote for this participant. Guest Performers, Results Show:Taio Cruz, and Bret Michaels. ^7 For safety reasons, ArcAttack had to perform outside the studio. The judges were required to be in person for this performance, but had to use hand-carried signs with red Xs on in place of their buzzers. Guest Performers, Results Show: Lin Yu Chun, Evolution of Dance, Season 1 Participants David & Dania. ^8 Osbourne accidentally hit her buzzer for this participant due to laughing at Mandel's reaction to the performance. It was not counted. Guest Performers, Results Show: LeAnn Rimes, and Criss Angel. ^9 Mandel purposely buzzed this participant before they began, in response to Morgan's use of the buzzer for his and Osbourne's Wildcard picks. It was removed afterwards. Advanced to Top 10 | Won Judges' Vote | Lost Judges' Vote. Guest Performers, Results Show: Jimmy Fallon, Kylie Minogue, and Season 4 Participants Recycled Percussion. ^10 For safety reasons, ArcAttack had to perform outside the studio. The judges were required to be in person for this performance, but had to use hand-carried signs with red Xs on in place of their buzzers. Guest Performers, Results Show: Cast of Le Rêve, and Jason Derülo. ^11 Mandel's voting intention was not revealed due to the majority vote for this participant. Guest Performers: Enrique Iglesias (Performance Episode); Sarah McLachlan, and cast of American Idiot (Results Show). Guest Performers, Results Show: Usher, the Goo Goo Dolls, cast of Cirque du Soleil, David Copperfield, and T-Pain. 7 "Orlando Auditions (Part 2)"
^ ""David Hasselhoff Departing America's Got Talent", January 6, 2010". TV Guide. January 6, 2010. Retrieved September 16, 2010. ^ "Howie Mandel To Replace Hasselhoff On 'America's Got Talent'". Access Hollywood. January 10, 2010. ^ Susan Boyle upset on America's Got Talent, additional text. ^ "Breaking News - Dramatic Developments Drive UPN". TheFutonCritic.com. Retrieved August 18, 2010. ^ "Listings - AMERICA'S GOT TALENT on NBC". TheFutonCritic.com. Retrieved September 2, 2010. ^ a b "TV Ratings Top 25: NBA Finals & Everybody Else, Glee Leads Scripted 18-49 - TV Ratings, Nielsen Ratings, Television Show Ratings". TVbytheNumbers.com. Archived from the original on June 14, 2010. Retrieved June 16, 2010. ^ "TV Ratings Top 25: NBA Finals Top Ratings Ranks, Glee Finale Leads Scripted - TV Ratings, Nielsen Ratings, Television Show Ratings". TVbytheNumbers.com. Archived from the original on June 18, 2010. Retrieved June 16, 2010. ^ "Tuesday Broadcast Final Ratings: NBA Finals Average Almost 18 Million - TV Ratings, Nielsen Ratings, Television Show Ratings". TVbytheNumbers.com. June 16, 2010. Archived from the original on June 24, 2010. Retrieved June 26, 2010. ^ a b c "TV Ratings Top 25: NBA Finals On Top, Lie To Me Sole Scripted Original - TV Ratings, Nielsen Ratings, Television Show Ratings". TVbytheNumbers.com. Archived from the original on June 25, 2010. Retrieved June 26, 2010. ^ "TV Ratings Top 25: America's Got Talent, Wipeout, Hell's Kitchen Crowd The Top Of Week's Ratings". Tvbythenumbers.com. Archived from the original on July 4, 2010. Retrieved August 4, 2010. ^ a b "TV Ratings Top 25: America's Got Talent, Bachelorette, Wipeout, Hell's Kitchen Top The Rankings". Tvbythenumbers.com. Archived from the original on July 11, 2010. Retrieved August 4, 2010. ^ a b "TV Ratings Top 25: America's Got Talent, Hell's Kitchen, Wipeout, Bachelorette Lead Week's Ratings". Tvbythenumbers.com. Archived from the original on July 16, 2010. Retrieved August 4, 2010. ^ a b "TV Ratings Top 25: All-Star Game, America's Got Talent Lead Week's Ratings". Tvbythenumbers.com. Archived from the original on July 23, 2010. Retrieved August 4, 2010. ^ "TV Ratings Wednesday: America's Got Talent, Think You Can Dance Fall; Big Brother Up vs. Last Year". Tvbythenumbers.com. July 15, 2010. Archived from the original on July 18, 2010. Retrieved August 4, 2010. ^ a b "TV Ratings Top 25: The Bachelorette, Hell's Kitchen, America's Got Talent & NCIS Lead Week's Ratings". Tvbythenumbers.com. Archived from the original on July 31, 2010. Retrieved August 4, 2010. ^ a b "TV Ratings Top 25: Hell's Kitchen, The Bachelorette, MasterChef, America's Got Talent & NCIS Lead Week's Ratings". Tvbythenumbers.com. Archived from the original on August 6, 2010. Retrieved August 7, 2010. ^ a b "TV Ratings Top 25: The Bachelorette Finale & NFL Preseason Lead Week's Ratings". Tvbythenumbers.com. August 8, 2010. Archived from the original on August 16, 2010. Retrieved August 12, 2010. ^ a b "TV Ratings Top 25: Hell's Kitchen Finale & 'America's Got Talent' Lead Week's Ratings". Tvbythenumbers.com. August 28, 2007. Archived from the original on August 20, 2010. Retrieved August 18, 2010. ^ a b Mozcarwilde says: (August 22, 2010). "TV Ratings Top 25: NFL Wipeout & America's Got Talent Lead Week's Ratings". Tvbythenumbers.com. Archived from the original on August 27, 2010. Retrieved August 26, 2010. ^ a b "TV Ratings Top 25: Emmy Awards & NFL America's Got Talent & 'Big Brother' Lead Week's Ratings". Tvbythenumbers.com. August 29, 2010. Archived from the original on September 3, 2010. Retrieved September 2, 2010. ^ a b "TV Ratings Top 25: Jersey Shore Bigger Than America's Got Talent?". Tvbythenumbers.com. Archived from the original on September 11, 2010. Retrieved September 9, 2010. ^ a b Golum, Rob. "NBC Dominates U.S. Broadcast Television Ratings With Football, Talent Show". Bloomberg. Retrieved September 15, 2010. This page was last edited on 8 April 2019, at 18:11 (UTC).